I occasionally post writing assignments/prompts that work for teen writers. They are simply suggestions for those of you looking for ways to challenge yourself or your students with a variety of writing exercises. If you are interested in more of these, visit our Resource Library and scroll down to the Writing Prompts section. 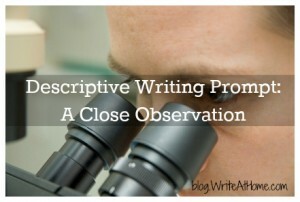 You’ll find them all grouped by writing purpose (i.e., narrative, descriptive, expository, or persuasive). In this descriptive assignment, assume the role of a scientist. Select an ordinary object — something you might find around the house or in your neighborhood — and examine it as carefully as you can. Look closely. Study it with an eye for detail. If possible, use your other senses —smell, touch, taste and hearing. Jot down notes. Make comparisons to other things. Take your time and try to see the object as if it were very valuable and you were looking at it for the first time. Remember that you are a scientist here. Resist any urges to get flowery or creative in your description. Precision and exactness are the most important aspects of this description. Aim for thoroughness. Leave nothing out. After you have taken your time to carefully observe the object, describe it in minute detail. Tip: Let your reader know right up front what it is you are describing. The “mystery description” angle is overdone with young writers.